When the boulders started arriving yesterday at Astor Place, I thought we were in for another immersive fan event for "Game of Thrones" ahead of its premiere Sunday on HBO®. 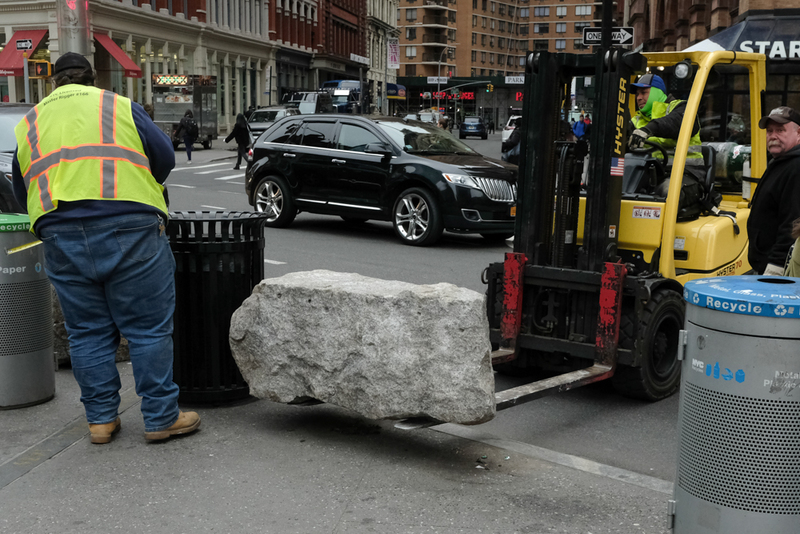 Today the @nyc_dot placed new granite blocks around the perimeter of the Astor Place South Plaza, and soon-to-be portions of the North Plaza. While it wouldn’t be unreasonable to ponder if these might be our latest public art, they are in fact new additions to enhance the safety of pedestrians and visitors using the plazas. The actual public art, cafes and seating remain just as open and accessible as always, except it’s now even safer for all to enjoy. Wow....a good idea is implemented to the benefit of the public without huge cost or fanfare. Safety. More seating. Natural materials. Low maintenance. Kudos. Not to be too negative... but they still haven't replaced the dead trees and plantings and cleaned up the garbage on the 3rd Ave/Bowery side. But boulders...Ok! Home Depot must have had a clearance sale on odd-size rock formations. @9:28am: I don't see the sudden need for these "anti-terrorism" hunks of stone - they are out of context, out of place, and look awful. So my question is: If NYC is so worried about terrorism, WHY did it take them so long to do anything about Astor Place? Conversely, since Astor Place is not, to my knowledge, a hotbed of terrorism, why do we need these literal stumbling-blocks? My only consolation is that the people who populate the Death Star and other glassy buildings facing there are going to have to see this ugliness when they look out of their windows. There's a bit of karmic justice there. Maybe they're hollow, with a space inside for rat poison. "But hey, we all know what an absolute *hotbed* of terrorism Astor Place is, right? Uh, wait, no.."
Actually, that could be said about any of the places that weren't targets (bike paths, Times Square, an esplanade in Paris, the London transit system, etc)--until they were. At the risk of being accused of being paranoid, I'll say that I feel safer in public plazas that have vehicle barriers. Did it make sense to prioritize Times Square over Astor Place? Of course it did. But if the resources are there to provide some protection at a relatively reasonable price, I'm glad to see it. As for aesthetics, I prefer the stone barriers to the charmless concrete blocks that one sees elsewhere.